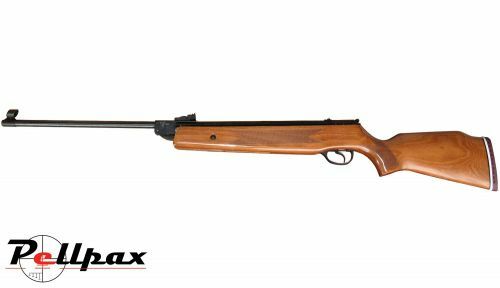 The Hatsan 60S Spring Powered Break Barrel Air Rifle is a favourite among spring rifle fans, thanks to its high build quality, and robust and reliable action. This latest model features Hatsan SaS shock absorbing system which helps reduce the felt recoil, on both yourself, and your optics. The Precision rifled steel barrel ensures that great accuracy is achieved at all times, and the tru glo open sights help this as well. A 9-11mm mounting rail is also milled into the breech to allow the fitting of additional optics. An automatic cocking safety, and a manual re-settable safety are also installed to make this a very safe rifle to own and use. This rifle comes with a 1 year warranty as standard. Scope and mounts not included. Sights - Adjustable Rear sight with Hooded front sight.